Yes, just when you think it's safe to go back in the water, a nasty shark-like creature appears, and it's back to the shoreline. Or, just when you think people have finally understood the line between sensitivity and insensitivity, you realize that the abyss that existed before still needs to be bridged. 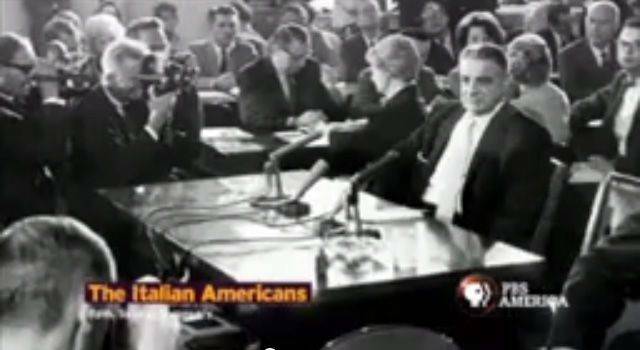 This morning, when I came to the John D. Calandra Italian American Institute, I was shown the trailer of 61 seconds for the PBS special "Italian Americans," which will be broadcast in England at the beginning of the new year. What is absolutley amazing (I use this term in the etymological sense, and thus NOT with any positive spin) is that the entire trailer smacks of the message that Italian Americans are, first and foremost, gansgters and criminals. There is no other way this can be read. One can make all the semiotic and hermeneutical (include, also, deconstructive) arguments one wishes, but the primary message is what it is: a charcateristic that is violent and, let us also add, sociopathic, undergirds this minute and one second. I shall stop here, as there is no need to burden you with other thoughts on the matter. It should all be evident. I have embedded the video here. if you cannot access it, most likely PBS has blocked it. You might be able to access it on YouTube: Buona visione! <<< .